Hotels have doctor on call facility. Rs. 10,000 to Rs. 13,000 based on plan (refundable or non-refundable). Upon arrival at Cochin Airport/Railway Station, our local host will meet and assist you at airport and later you will proceed to Munnar. On arrival at Munnar check in at hotel, later go for sightseeing at Mattupetty Dam; a beautiful spot for viewing the picturesque Munnar, Kundala Lake- a natural lake with recreational facilities like boating and having excellent view of Western Ghats as well as the forest surrounded with. Morning after breakfast proceed to visit Eco point and tea plantations. In the afternoon you can visit Eravikulam national park, where the endangering Nilgiri Tahr is conserved. After Breakfast, Check out from the hotel & proceed to Thekkady. Thekkady offers diverse attractions like Periyar Wildlife Sanctuary, Hill Station and Spice Plantation. Here you can go for a Wildlife cruise to view a large variety of wildlife like Wild Elephants, Nilgiri Langur, Sambar Deer, Wild Bison and quite a lot of unique birds can also be spotted. You can take a behind-the-scenes look at a spice plantation (additional cost). Go boating in Periyar lake and check out the Tiger Reserve. You can also opt to go on a Jeep Safari of the Periyar National Park, and take a tour of the Tropical Chocolate factory and Mangla Devi Temple. Spend your evening witnessing the Kadathanadan Kalari (famous form of Kalari Payattu) and Navrasa Kathakali performance. Checkout from the hotel and proceed to Alleppey Houseboat to board by noon. 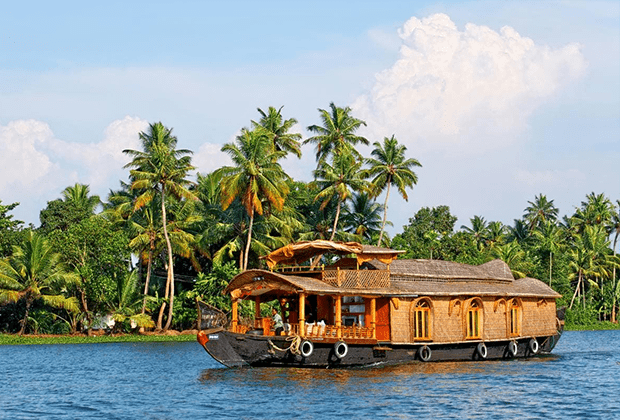 Houseboats are the modern forms of kettuvallams or rice boats which were used as ferries to carry rice. Lunch on the houseboat and later cruise through the narrow canals of the Vembanad Lake. The boat moors on the lake for the night by evening. After dark you can enjoy a delicious dinner to the sound of water lapping the side of the boat. 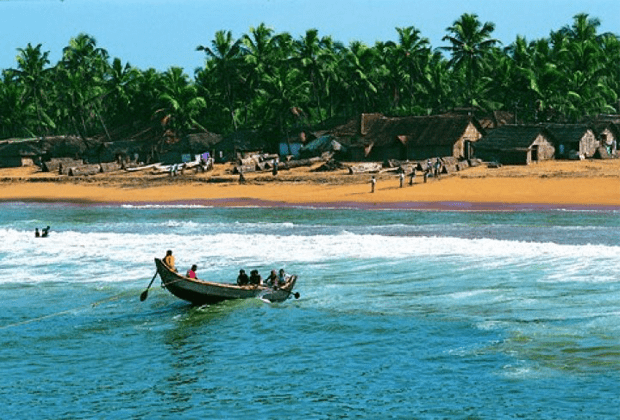 After Breakfast, Check out from the Houseboat & Proceed to Kovalam sightseeing. Take a leisurely trip to the Lighthouse, located at the southern end of Kovalam Beach. It houses the Vizhinjam marine Aquarium – established in 1997, has rare species of invertebrates, and ornamental fish. Visit Hawa Beach, Lighthouse Beach Water and enthusiasts can take part in optional activities such as kayaking or swimming, or you can chill by the beach. After Breakfast, proceed to Kovalam full day at beach or you can go for a sightseeing tour to Trivandrum city, the capital of Kerala. There you can visit Sri Chitra Art Gallery that houses paintings from the Mughal, Rajput and Tanjore schools of art. Take a relaxing evening. You will be transferred to Trivandrum airport for departure. 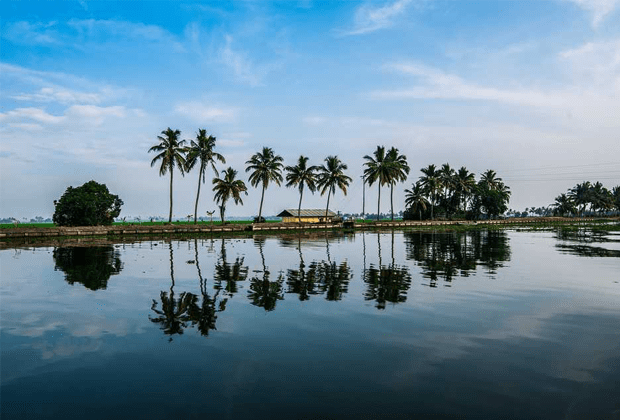 1.What is the best time to visit Kerala? Answer 1: You can visit Kerala all year round. 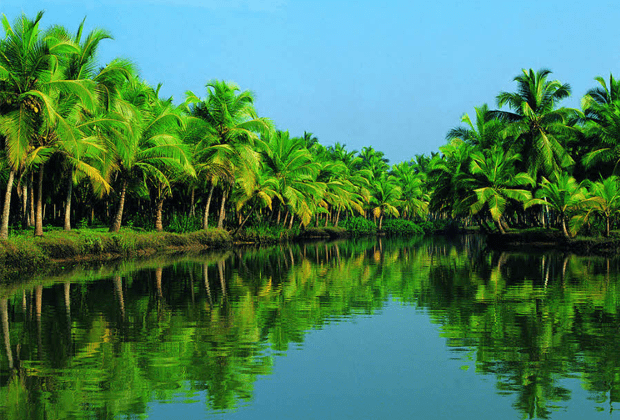 However, if you want to catch the backwaters at their most glorious, monsoons are the best time which is June to September. For visiting hill stations like Munnar, winter is the ideal time for it. 2. What clothes should I carry? Answer 2: Kerala’s climate is tropical. It is mostly hot and humid. Carry light cotton clothes or summer wear. You may want to carry beach wear as well because in Kerala, beaches abound. Don’t forget your sunglasses and sunscreen lotion. 3. Are credit cards accepted in hotels and restaurants? Answer 3: All major credit cards are accepted at big hotels, restaurants and shopping malls. 4. What papers should I carry? Answer 4: Carry your photo identity proof like your AADHAR Card and pan card. Carry your wallet and make sure you take money. Carry your passport to be on the safe side. 5. Are there emergency medical services? Answer 5: Yes. The hotels have an on-call doctor. 6. When should I confirm my trip? Answer 6: Let us know three months before the trip so we can make travel and hotel reservations. We had an amazing trip. The guide managed to provide all support to me and other group members, and I made quite a few new friends along the way! Thanks to TriBeCa Travels, I have had a convenient way of arranging trips for my parents. I can’t always take leave from work and it helps to have someone taking care of all the arrangements without me having to take time off. According to my mum and dad, they had a great time! All the hotels we stayed were great, as well as the places we visited. We are planning and saving for our next trip with TriBeCa.